Coming off a whirlwind release day the week of Comic-Con International and supported by special events at comic book stores around the country, THE WALKING DEAD #100 by Robert Kirkman and Charlie Adlard will receive a second printing after selling out of its record-setting first printing. 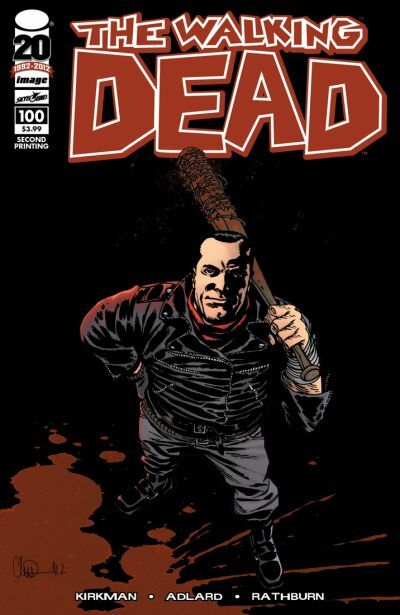 At 383,612 copies, the sales of THE WALKING DEAD #100 were the best initial orders for a single issue of a comic book since 1997. The second printing of the milestone issue will feature a new cover with art by Adlard. It is available for order now with the Diamond code JUN128066 and will be in stores on August 15, the same day as THE WALKING DEAD #101.